In the United States, our ideas on drinking are always so strict. Liquor is a deadly serious topic while an aperitif should be lighthearted. It seems as if we have forgotten about aperitif cocktails while the low-ABV and spiritfree movement are catching hold. We are passing over the original low-ABV OGs. This, of course, is nothing new in the cocktail world. We tend to jump from new thing to new thing and often disregard the classics that started it all. An aperitif is under the cocktail umbrella in a way. It sometimes feels like it is more of an idea than an actual object. If anything an aperitif is a state of mind. It has more in common with a highball or standard mixed drink (gin and tonic, vodka soda) than it does with an actual cocktail. It is a primer to a meal. A cocktail can also be a primer but you wouldn't, or shouldn't rather, sit at a bar and have an aperitif before a cocktail. That's like having a Ceasar Salad before a Wedge or wearing a brown belt with black shoes-- pretty weird and just plain wrong respectively. Choosing to have an aperitif is choosing to stay on the lighter side of things. Champagne can be an aperitif. Manzanilla or Fino Sherry, of course, fit the bill. Potable bitters and Amari fall into this category as well. Products like Suze, Aperol, Cynar, Montenegro, and Campari. 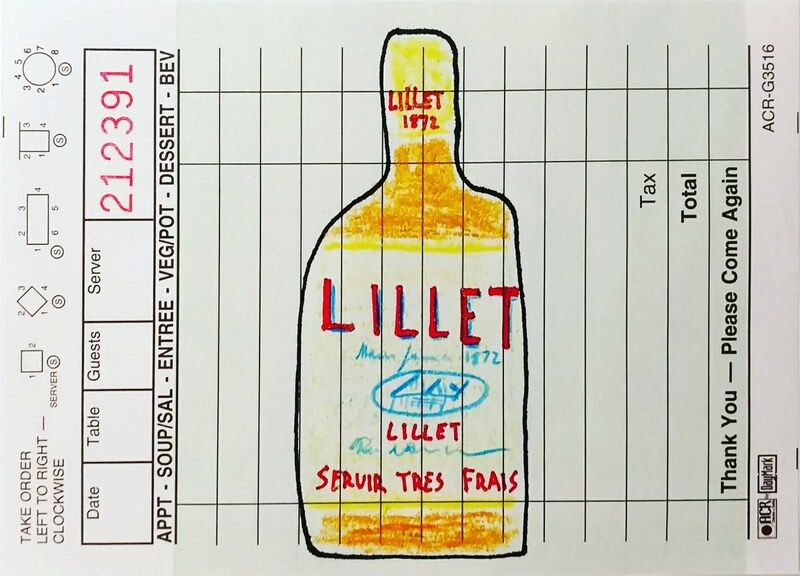 You also can have fortified and/or aromatized wines like Lillet, Cocchi Americano, Punt e Mes, Cinzano, Dubonnet, and Byrrh. All of these things can be drank neat at room temperature, chilled, or served over ice. They can also be mixed with each other or splashed with soda water or sparkling wine. Lemons and oranges reign supreme for garnish but herbs, seasonal berries, or a quick cigarette all work well if your drink needs bells and whistles. An Old Fashioned is not an aperitif, and neither is a Manhattan. I would go as far as to say that the Negroni is pushing it in terms of strength to be classified as an aperitif, though I'd have to ask Matt Hranek his thoughts on that to be sure. It may all come down to how it gets made. Compare a Negroni in NYC to Tuscany. One of these is a cocktail while the other is an aperitif. The Martini is a Martini. Yes, it is excellent with oysters, olives, salads, jazz, and nothing at all but it isn't an aperitif. If you are drinking a martini, you have skipped the aperitif and if you have an aperitif and then a Martini I think you have missed the point of both drinks altogether and should probably call a cab to get you to dinner. You shouldn't measure aperitifs. You shouldn't be stirring, shaking, and straining them either. If you need to mix a heavy amaro or bitter like Campari with light soda water or sparkling wine you can use a slice of orange or whatever citrus you have laying around. A possible exception to this rule would be a corkscrew or bottle opener. Pour some of that in a glass (add ice if you care to) and be done with it. Unless you take a photo and post it to Instagram with the hashtag #spritzlife or #ciaobella, in that case, it should cost a fortune. Cocktails are expensive and high octane. Aperitifs are cheap and low octane. A round of aperitif-style drinks should be around 8-10 bucks a person but your friends Aperol spritz may ring up to 15 bones because of the Instagram tax. The sun should still be up, and you should not have sat down to the final meal of the day yet. Why would you have an aperitif after dinner? That is a job for the digestif. Chips, cured meat, cheese, olives. Snacky things. Little bites. In Italy the snacks are free, you pay for the drinks. The time allotted for the aperitif isn't about what you are drinking. It is about the people you are with and the end of the working day. Restaurants needn't be one-stop shops, and if you are going out to dinner, your entire party should show up at the same time to make it easy on the host(ess). Meet somewhere ahead of time for aperitifs and then move on to dinner. If you are meeting for dinner at someone's home meet up at a spot down the street with the other guests for an aperitif before arriving. The hosting couple will appreciate an on-time arrival and everyone will appreciate a tiny amount of alcohol to reduce anxiety and awkwardness. ESPECIALLY if you are planning to have a cocktail at the restaurant when you arrive, one aperitif is plenty. I am pretty sure once an appetite is whetted it remains that way until the meal is delivered. Who wants to drink three Suze and tonics or three glasses of Fino Sherry anyways? The aperitif is a quick thing. It should be like running in for an espresso or a quick coffee meeting. Get in and get out a little better than when you arrived. You don't have to finish anything actually, but if its time to go and you are the last one sipping leave that half drank pink fizzy drink and get a move on before your reso gets bumped. I promise they have cocktails and wine at the restaurant. Oh yeah. Well...disregard all of this and drink what you like. I think the main point I was trying to get across was not to wear black shoes with a brown belt.